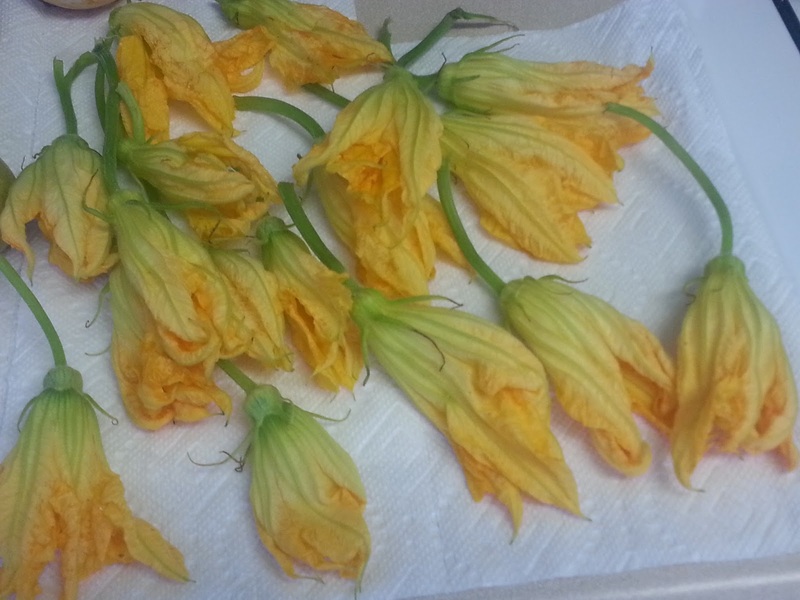 I hesitantly ordered the stuffed fried squash blossoms appetizer at dinner once, tried one bite, and was hooked!! They are a delicate flower stuffed with an herbed ricotta cheese, fried, and topped with a pesto and lemon aioli. Have you local friends ever been to Cucina Enoteca, at the Irvine Spectrum? They opened one at Fashion Island, in Newport Beach, too. It is such delicious, inventive Italian food! 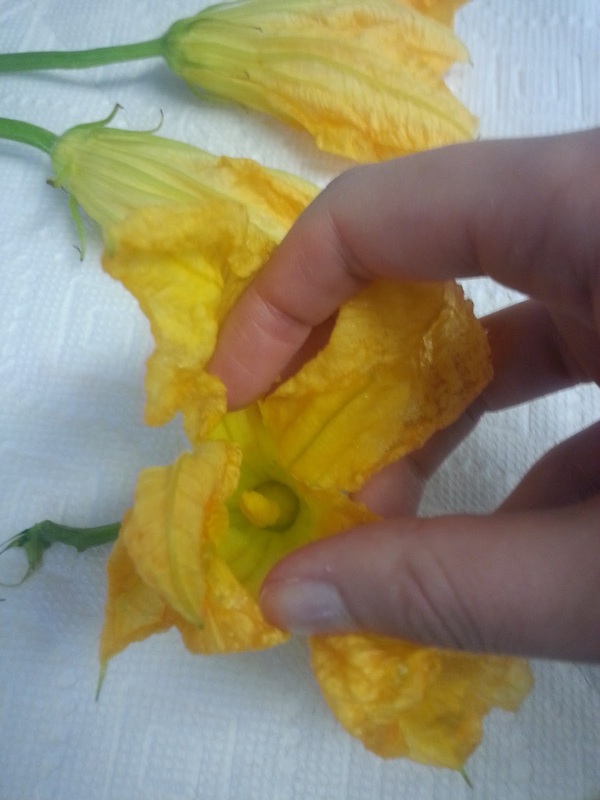 These squash blossoms were so interesting and amazing, but not really something you could re-create at home, unless you grow your own squash. Or, so I thought! Until I spotted some zucchini squash blossoms at the farmer's market one day! I had to try to recreate this yummy dish! I totally lucked out. 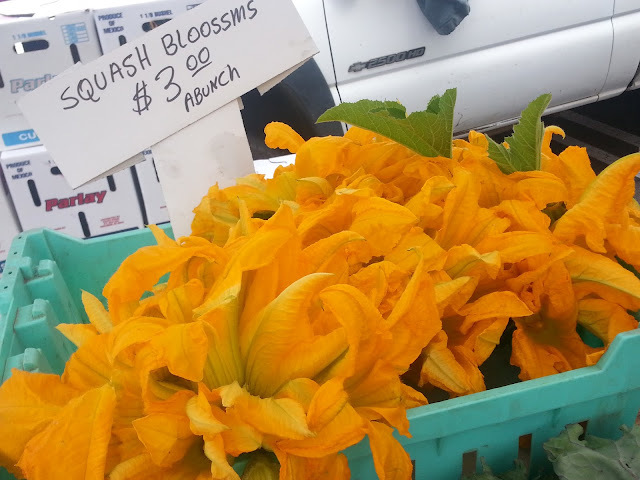 I had never seen them before, and cruising the tail end of the Laguna Beach Farmer's Market one Saturday morning, I just happened to see one lonely section of squash flowers over in a corner, on a table with zucchini and other produce. I ran over, and asked if they were for sale! They sure were, and they were like $.50. I was so stoked! I could finally attempt this dish. Squash (Zucchini, or otherwise) Blossoms are the flower on the plant, and they look kind of like a closed up lily or hibiscus flower. You have to handle them very delicately, washing them, and removing the pollen stem in the center. But they are so fun and interesting, it is worth it once in a while! They have a light squash taste, but are more just for fun, and a good vessel, in this case, for cheese! Carefully wash the flowers, and dry well. Remove the stamen, or pollen covered center, down in the middle of the flower, trying not to tear any petals. Mix together cheeses, herbs, and salt and pepper. Transfer into piping bag, or ziplock bag, with the corner snipped off. Hold a blossom with one petal pulled back, and gently pipe about 2 Tbsp of these cheese mixture into the flower. Close flower petals, and twist ends closed. Repeat with all remaining flowers. Heat 1-2 inches of olive oil in a large saute pan over medium to medium-high heat. Whisk eggs until frothy in a bowl. Put breadcrumbs into a shallow dish. Dip one blossom at a time in the eggs, and then into the breadcrumbs, then gently place into the hot oil. Cook for about 3-4 minutes, turning once. Lay on a paper towel to drain. Sprinkle with salt. Serve with pesto and lemon aioli, or simply a lemon wedge. Such a unique and fun appetizer! 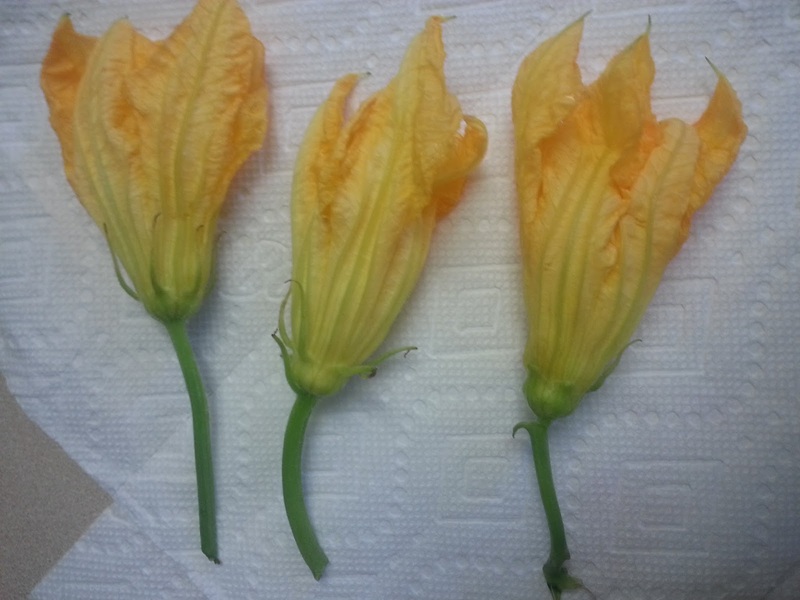 Have you ever tried or bought squash blossoms?